Older is not necessarily always better! 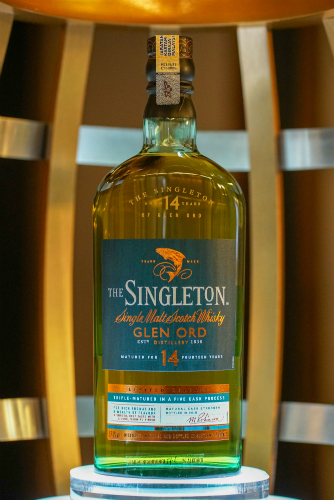 The Singleton of Glen Ord takes that to heart for the release of their latest limited edition single malt expression, the 14 Year Old. What sets this apart is the unique triple maturation process in five wooden casks – Refill American Oak, Ex-Bourbon Hogsheads, Ex-Bodega European oak butts, charred Ex-Pedro Ximenez and Ex-Moscatel wood cask, and lastly married together in European oak puncheons. This is thought to be the first time that different woods have been used to mature a single malt Scotch whisky, resulting in rich and complex flavours. You can expect of the 14 Year Old some smooth, sweet, and spicy notes on the palate. Flavours like baked apple, orange zest raisins, smooth barley sugar, and honey come about, leaving with a long finish and enduring warmth. Only 516 bottles are available in Malaysia, as expected for a limited edition release. They’re available for purchase on StayThirsty, and can also be found in bespoke cocktails at BRIXTON 23 for a limited time only. Getting tired of the same old, same old? Here's something new to get your hands on.